Martin’s Dad, Paul kindly contacted me back in 2015 to say that he followed my photography work online and would I be available to photograph his son’s wedding in 2017. I think this was my furthest in advance wedding photography booking I had received at the time but of course I said yes and before we knew it we were in 2017. 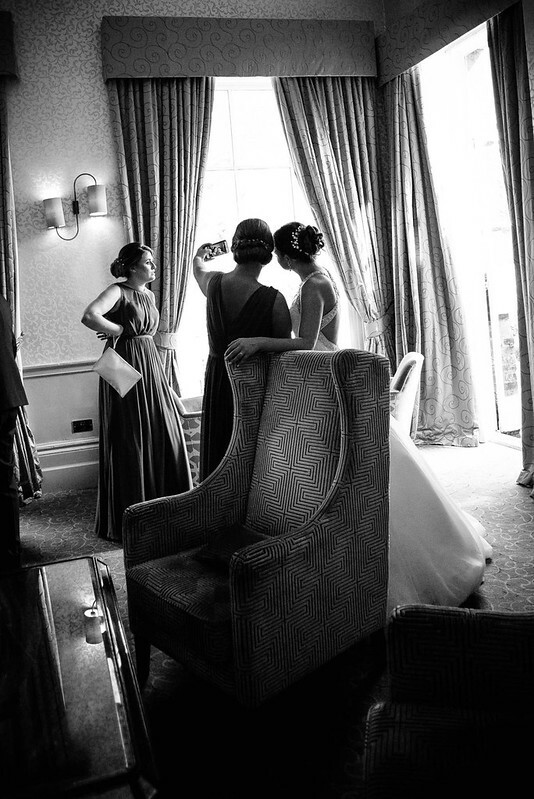 The wedding venue of choice was Mottram Hall in Cheshire. I had not photographed at Mottram Hall before but it is a beautiful wedding venue with amazing grounds and the stunning house at the heart. I travelled to Cheshire from my home studio in Coventry and met everyone at the venue. After saying hello’s to Martin and Paul I met Emma and the girls to start bridal prep photos and the rest of the day kind of past in a blur! Here are a sample of Martin and Emma’s wedding photos captured with my Leica M240 camera. The most used wedding camera lens on the day by far was the Carl Zeiss ZM Biogon 21mm f2.8 lens. Very sharp and wide enough to capture all the action. Note* After not viewing the files since April 2017 until now I reworked some of the images (cropping and B&W conversions mostly) to suit my current taste.